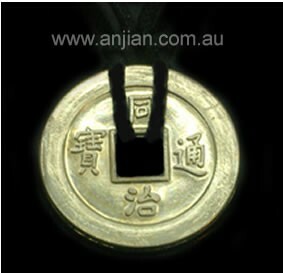 Ancient Chinese coins have been used for centuries as amulets to ward of evil and disease. They were often worn by children (one coin added each year until the age of 15) after being first placed on a deity for blessing. i.e. Laughing Buddha, Quan Yin. In Feng Shui, coins represent the element metal and symbolise wealth. String together 3 coins on red thread and place in the wealth sector, or place on accounts book or near cash register. Three coins are used for reading the I Ching, by naming one side Yin and the other side Yang, and reading from the trigrams for ancient advice on how to improve and harmonise one's life.